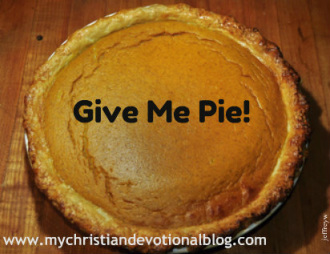 A pre-Thanksgiving devotional that will get you thinking about life ... and pie. ​It was a less than perfect dinner. My husband was working late, and we were out of frozen food -- except for chicken nuggets, and I had served those the night before. So, I tried a new recipe, and it didn’t go over well with my nugget-loving son. Maybe that's what got the ball rolling. We should have prayed over Mom before we prayed over the food. I was exhausted when I finally sat down. My young toddler has learned to scream and copy the behavior of her brothers and, needless to say, it was not a good night to copy. One of the boys asked me a question, which, in turn, led to more questions from the other brothers. Everyone was talking but me. That started the arguing, the baby started her high-pitched copying and all the while, my six-year-old daughter was discreetly trying to tell me that the dinner wasn’t one of her favorites. I had about lost it—when I remembered dessert. I had baked a pre-Thanksgiving pumpkin pie from scratch that afternoon, not a “canned” pumpkin pie, mind you. It was an honest-to-goodness, grown-from-the-garden pumpkin pie -- something I didn't dare attempt to do before moving to the country. With dinner a near disaster, I pulled the dessert “card.” No one deserved it, maybe least of all my toddler whose fork had hit the floor at least six times during the meal. But who can say they ever really deserve pie? I turned to my chubby-cheeked little girl and said the magic words. _ I didn’t even know she knew what pie was. Silly as it may sound, pie for me is one of God’s special bonuses in this complex world. A reprieve, a joyful moment. In college, when my head was filled with the pressures of study and exams, I would cheer when the vending machine was restocked with crisply wrapped Hostess Fruit Pies. Blueberry was my favorite. And recently, I overheard an opinion on pie from a different generation at a Thanksgiving church dinner. Two older gentlemen were discussing dessert, and I think they were a little upset that their favorite sweet had been overlooked by the church ladies who had baked that day. I really couldn’t help listening in. I loved getting an inside look at their world, and this was serious business for these fellows. “They’ve all kinds of cakes up there, but they don’t have what men like. They like pie!” said one of the gentlemen. I know they weren’t complaining, really. They were happy that their stomachs were full. And they weren’t exactly stretched to the limit as I had been, but they were disappointed, I can say that much! A ray of hope came for them when a woman sat down with something that resembled a cheesecake. At least it was in the shape of pie! Looking back at my situation, I guess my daughter has a bit of my pie-loving self in her genes. And the old guys at church, they get it too. There is something to be said for taking sweet moments for yourself. Sometimes for me, it comes in reading Scripture, getting “huggies” from my toddler, or stopping to watch the stars in this beautiful country sky. Moments like these can be different things for different people. ​But whatever you do, be sure to top it off with a nice piece of pie!